Bengaluru, 15 February 2017 – Airbus has brought India’s first dedicated heli-ambulance, an Airbus H130, for display at Aero India 2017. The helicopter is fully kitted out with specialised emergency medical care equipment and is conducting a live drill of its life saving service at the entrance of Hall B. 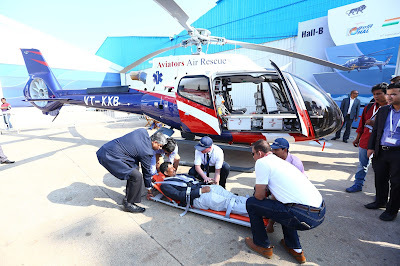 The Helicopter Emergency Medical Services (HEMS), as it is called, was launched in January 2017 by Bengaluru based Aviators Air Rescue with a fleet of three H130 helicopters. This pioneering service is the result of a tripartite agreement between Aviators Air Rescue, Air Medical Group Holdings Inc., a leading air medical provider in the United States and Airbus Helicopters. All three H130 are being put to use for medical missions only and are equipped with specialised equipment for emergency transportation of patients, organs, neo-natal and other time critical medical missions. The rollout of the service follows the last year’s release of regulatory guidelines by the Indian Directorate General of Civil Aviation (DGCA) for the operation of helicopter EMS in India. The new guidelines allow the use of single-engine, dual-pilot helicopters. In the first phase the services will cover the entire southern region. AMGH and Aviators have options to acquire additional helicopters for expanding the service to other cities in India.